Creep is often seen as an undesired effect in metals, which may be a limiting factor in the lifetime of steel components. It may lead to premature fracture below the yield strength when exposed to elevated temperatures for long times, in combination with constant high stress. Self-healing is a promising approach to increase the lifetime performance of iron-based alloys and steels, which could drastically reduce maintenance and material costs for aerospace propulsion systems. Improving the lifetime of critical air- and spacecraft components in high temperature environments is an essential aspect when it comes to making future airplanes more sustainable. Conventionally, making the material as strong as possible, preventing damage to evolve in the material, increases the lifetime of materials. With the idea of self-healing, damage at small scale is actually allowed in the material. Although these materials are less strong, they are capable to heal themselves to increase the lifetime. One may better speak then about damage management, rather than damage prevention. (Garcia, 2010) Here we can learn from nature, because it is already proven from evolution that it works very well in biological systems. This thesis research is only a small part of a larger research project on self-healing creep steels, which is conducted by Shasha Zhang and supervised by Dr. Niels van Dijk at the department of Fundamental Aspects of Materials and Energy (Reactor Institute Delft). This project is also part of the IOP Self-healing Materials Program chaired by Prof. Sybrand van der Zwaag, and is funded by the Dutch government. When plastically deforming a metal, e.g. by creep, defects will be nucleated in the material. When these grow, they can combine and may form ultra-fine nano- and microcracks. Consequently, this may lead to failure of the material. It is hence preferred to immobilize the growth of cracks already at the nano-stage. Figure 1: Schematic overview of the damage and self-healing mechanisms. applied and nano-cracks are starting to develop, the solute elements will become available to diffuse towards these damage sites. These solutes will then come out of the solution in the matrix, and will form Au or Fe2Mo precipitates to fill these nano-scale cavities or cracks (Van der Zwaag, 2011), see figure 1. In this situation creep damage is immobilized by site-selective precipitation, so that this damage remains static at its position. Hence, no ‘magic’ or nanobots are involved here. Therefore, it is crucial to gain understanding about the correlation between the defect evolution and the precipitation behavior at high temperatures, in order to fully utilize the precipitation-induced self-healing mechanism in iron-based alloys. The main part of this study was focused on Fe-Au and Fe-Au-B-N alloy samples, a type of steel that is being investigated since a couple of years and initiated at the time by Van der Zwaag and Van Dijk after intensive studies of Fe-Cu type alloys. The addition of copper to the iron has given some promising results, although the formation of Cu precipitates was not found to be occurring in a site-selective manner only at the damage sites, but more homogeneously through the material. Therefore, the idea to study iron with the copper atoms replaced by gold or molybdenum elements as a healing agent came into mind. The reason why gold and molybdenum are selected has to do with their larger atomic sizes compared with the ‘host’ iron matrix atoms. This large atomic size difference results in a high strain energy, and therefore in a high energy barrier for nucleation of precipitates in the iron-matrix. Gold or molybdenum therefore tend to segregate out of the bulk material towards the surface when it is dissolved in the iron-matrix. If this is the case, it should also have a preference to segregate towards nanoscale voids. This makes Fe-Au an excellent system to achieve selective Au segregation at defect sites, which is an important requirement for self-healing of defects. (Zhang, 2013) Whereas for gold some of the self-healing capabilities are already proven in previous researches, molybdenum is very recently selected to explore its self-healing potential in Fe-Mo alloys. By means of positron annihilation techniques used at the radiation facilities at the RID, the evolution of the defects inside the material and the healing of these are studied. Material samples of Fe-Mo and Fe-Au with and without boron and nitrogen atoms have been manufactured, on which several (cyclic) experiments are performed. The cyclic measurements on Fe-Au and Fe-Au-B-N formed the main part of the experiments. After performing a solution heat treatment at 868°C for five hours, the samples are quenched to room temperature to obtain a super-saturated solid solution where all gold (and boron, nitrogen) atoms will be dissolved and trapped in the iron-matrix. Subsequently, a positron measurement with Coincidence Doppler Broadening (CDB) is conducted to measure the initial state of the material. After this, a small plastic deformation is introduced in the material by doing a tensile test, followed by an ageing treatment at 550°C for ten minutes (i.e. the healing step). Two positron measurements are done here: (1) after the deformation step and (2) after the healing step. These deformation-ageing steps with positron measurements are then repeated for a certain number of cycles. A so-called S,W-plot is then obtained from the results. Furthermore, Vickers hardness and creep tests have been carried out in combination with Scanning Electron Microscopy (SEM), and also diffusion-based finite-element model calculations are performed to study the time it takes to fill a cavity. This may give additional (theoretical) insight in the diffusion processes of the solute elements towards the nano-scale defects. Figure 2: Positron data showing the S versus W parameters for the Fe-Au alloy. AQ: As Quenched. The cyclic experiments with repeated deformation-ageing cycles with CDB measurements that have been conducted with Fe-Au(B-N) alloy specimens, have resulted in an S,W-plot such as can be seen in figure 2. This figure shows the S versus W parameters for the Fe-Au alloy, normalized to the values of annealed iron, and is obtained from positron annihilation spectra. The blue line indicates roughly the trend for the range of the data points. This plot works as follows: when a material is in a deformed state, the S and W should shift in the direction of the defect. After performing a successful healing step, the point should shift to the direction of Au. Figure 3: Creep cavity filling times for various volume and grain-boundary diffusivities. For a Fe-Mo alloy, finite element computations were carried out using a diffusion model based on continuum mechanics using the SEPRAN package. Here, creep cavity-filling times for various volume and grain-boundary diffusivities have been computed, as seen in figure 3. Moreover, so-called time exponents for creep cavity filling are derived from these computations. It follows that the filling of a creep cavity on a grain boundary can be well compared with the growth model of a precipitate on a grain boundary, which is already extensively studied by other researchers in the past. For Fe-Mo, Vickers Hardness tests have revealed two distinct stages in the precipitation process: a constant hardness stage and a stage where the hardness is reduced significantly (see figure 4). This could be explained by segregation towards precipitates at (sub) grain boundaries (or dislocation clusters), so that the bulk inside the grains becomes solute depleted. Hence, it could be derived from this that the solutes are selectively moving to the damaged sites. 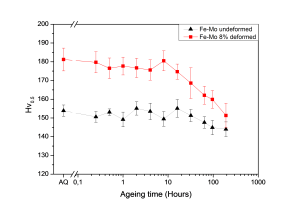 Also, from CDB measurements and SEM observations, it has been found that induced dislocations and other open-volume defects enhance the segregation and precipitation of Mo and Fe2Mo. Hence, there should be a tendency for site-selective precipitation at these defect sites. This would make molybdenum a promising self-healing agent for deformation-induced defects next to copper and gold, however further investigation is required to make it a proper alternative for application in iron-based structural alloys. 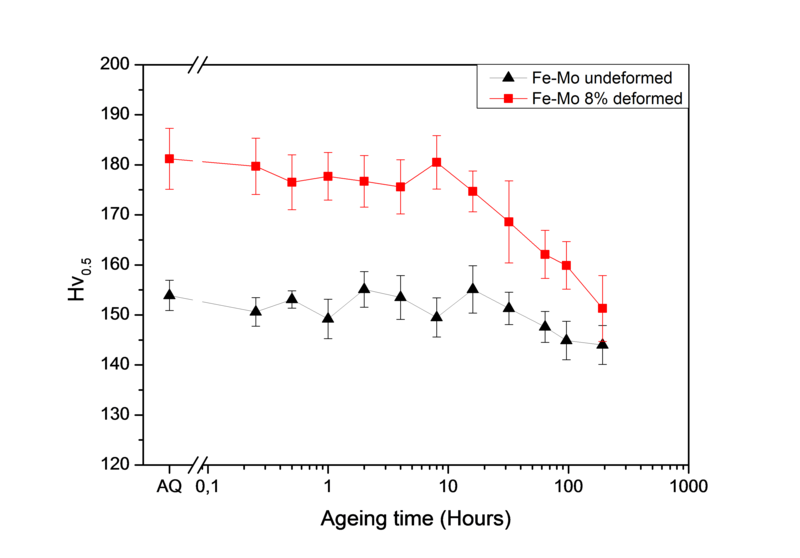 Figure 4: Vickers hardness results for undeformed and deformed Fe-Mo alloy. AQ: As Quenched. 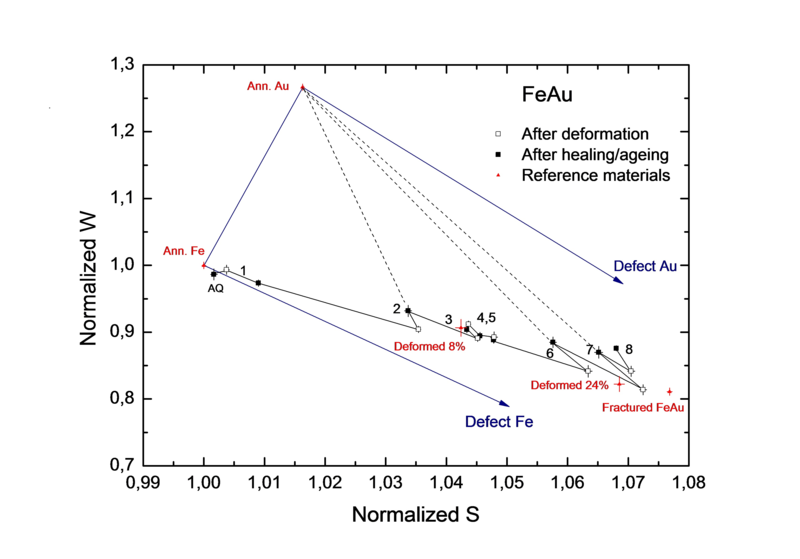 Overall based on the results in this research project, especially the Fe-Au system shows a high potential for achieving self-healing behavior of deformation-induced defects. Molybdenum could become a proper alternative to gold, although more research is required for this alloy element to gain more insight in the material processes. Finally, self-healing of deformation induced defects could be seen as a promising approach to extend the lifetime of iron-based alloys for structural applications at elevated temperatures. If you have further ideas or want to contribute to this research as a graduate student, you may contact the author for further information. Garcia, S.J. and Dingemans, T., “Self-Healing Materials”, Lecture slides, Delft, 2010. Callister, W. D. J., “Material science and engineering, an introduction.”, 7th revise. New York: John Wiley & Sons, 2006. Van der Zwaag, S., “Self Healing materials – concept and applications”, 2nd edition, Ministry of Economic Affairs, Agriculture and Innovation, NL Agency – NL Innovation: IOP Self Healing Materials, 2011. 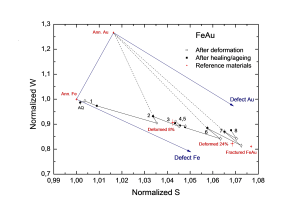 Zhang, S., Kohlbrecher, J., Tichelaar, F.D., Langelaan, G., Brück, E., Van Der Zwaag, S., and Van Dijk, N.H., “Defect-induced Au precipitation in Fe-Au and Fe-Au-B-N alloys studied by insitut small-angle neutron scattering”, Acta Mater., vol. 61, no. 18, pp. 7009–7019, 2013.